Once again, it’s my fave day of the week. Celebrating Everyday Life with Jennifer Carroll that you will love. Hello, hello to friends old and new at Worthing Court! I want to say a big THANK YOU to Suzy for inviting me over to share my home with you today! 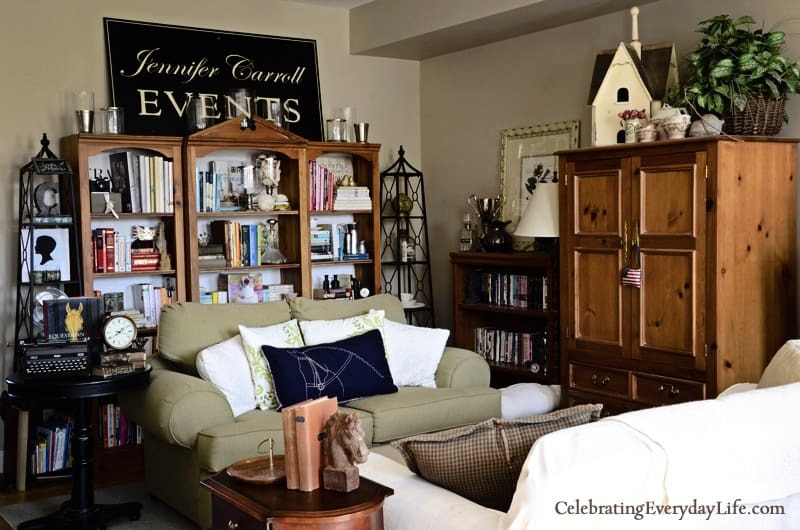 My name is Jennifer Carroll and I blog over at Celebrating Everyday Life. 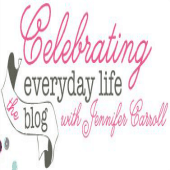 In addition to the blog, I am also the publisher of a new magazine also titled Celebrating Everyday Life with Jennifer Carroll, which is launching late next month. But today I’m here to give you a tour of my home. This is my first home tour – I’m inspired after this to add it to my own blog! – I hope you enjoy it!! Let’s begin in the heart of my home, the kitchen! I moved into my home almost a year ago and this hutch project was the first furniture DIY project that I attempted. 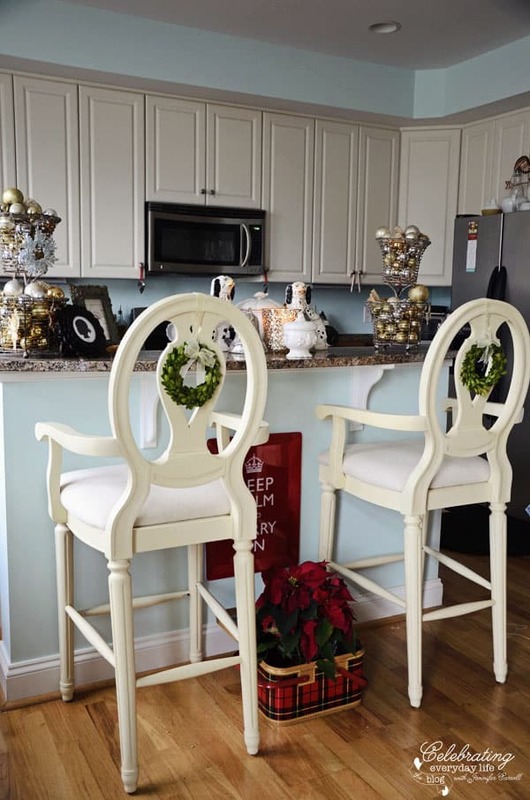 It was also my first foray into painting with Annie Sloan Chalk Paint and may I say I have never looked back! This paint has been DIY-life changing! My dining room has a fireplace in it which reminds me of a keeping room – I love the idea of that. I have fun decorating my mantel for the different seasons. 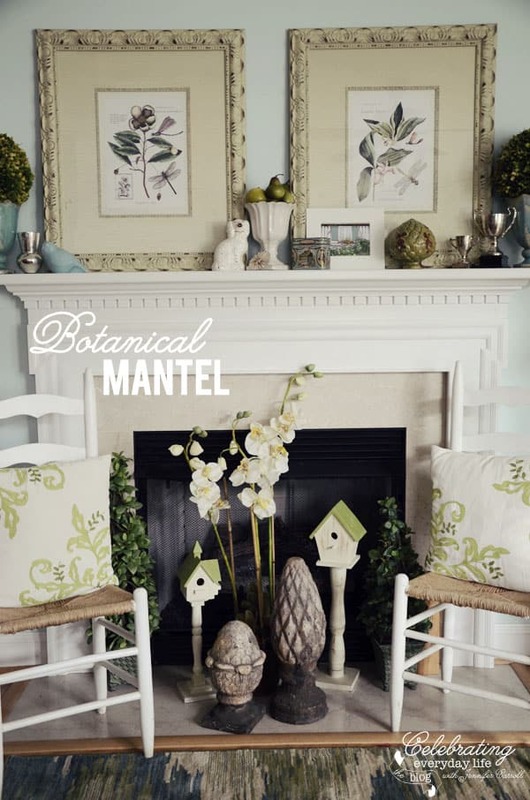 This was my mantel for Spring before I moved these prints into my living room. I like to move things around a lot so things are always changing around here! This is a snapshot of my mantel area at Christmas! I love my angel wings hanging on the stairwell wall. 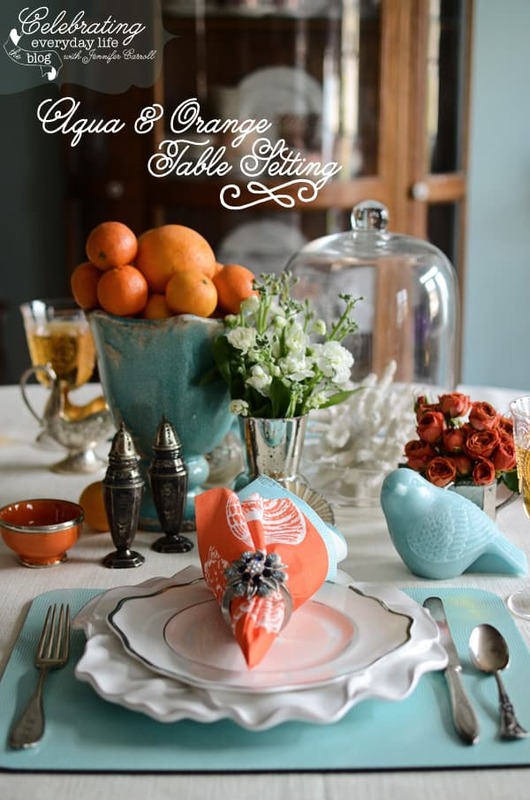 I love creating pretty tablescapes on the blog and surprisingly I haven’t photographed my entire dining room so at least here you get a peek at what I get up to in here! My living room is the room that’s hopefully about to undergo the most change… I’ve got plans to paint a lot of the furniture in here which I’m hoping will really lighten the feeling in this room. It doesn’t get as much daylight as I’d like and these wood tones just make it feel darker. As the weather continues to warm, my fingers are itching to grab a paint brush and get started!! 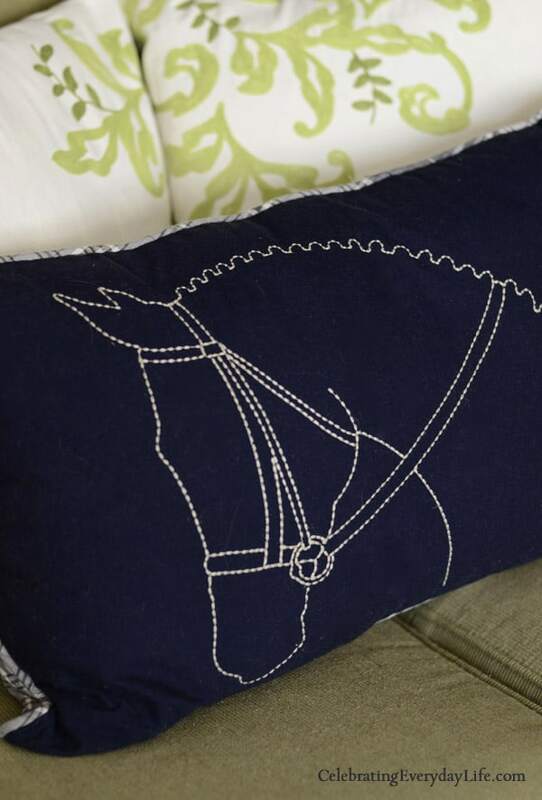 My favorite American designer is Ralph Lauren and I adore horses so I have lots of equestrian details in my home and always keep my eye out for great equestrian accessories like this horse pillow from Target. This is my daughter’s bedroom. I’ve blogged about the curtains I made in here (fun note: I used shower curtain rings to hang them!!) but have yet to share the whole room so you’re getting a first look at it! 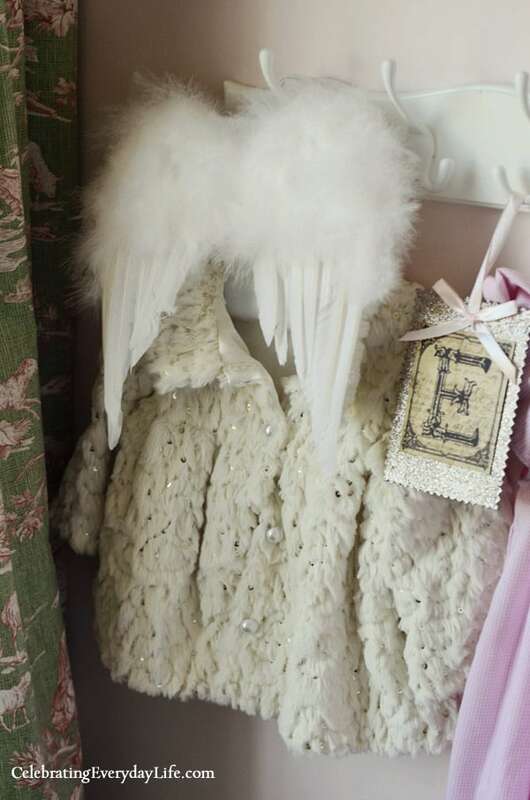 Since she’s my “little angel” I couldn’t resist adding this sweet baby angel wings to her decor. 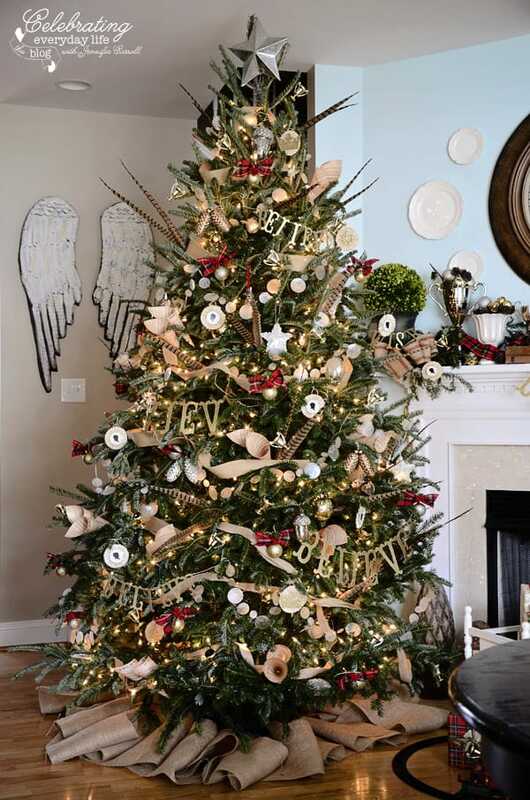 A fun touch of whimsy! Stay tuned on my blog for a few more photos of this room. I know the rug doesn’t match the canopy but for me, it’s still a lovely compliment and I adore the pattern so much that for me it works and at the end of the day, that’s what matters most is that this room makes me feel happy! 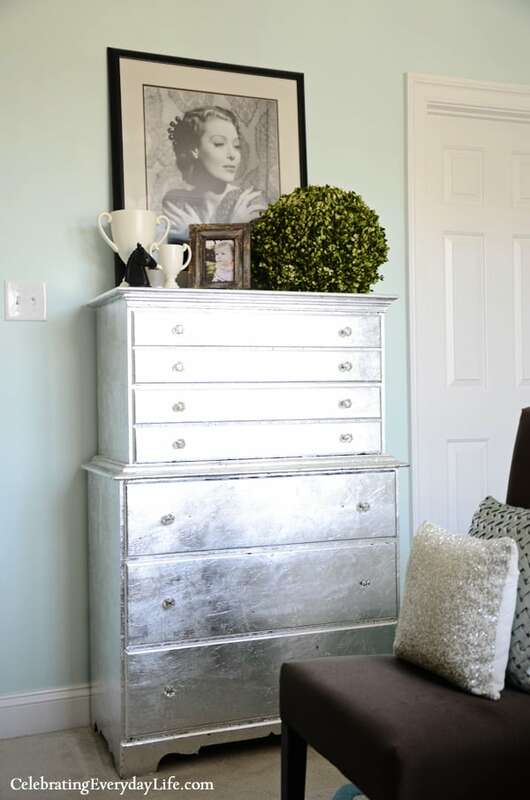 This silver leaf dresser project was a big project I took on before I moved in and I still adore the dresser. It was my grandmother’s and I love having something of hers that now also adds a bit of glamour to my room with all its silver sparkle! 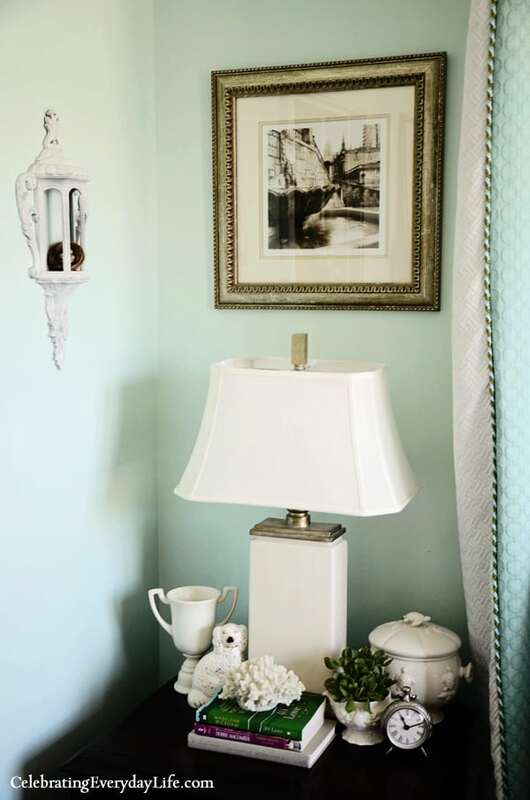 I hope you enjoyed this glimpse into some of the rooms in my home. I feel like there is still so, so much to do here but as I stop and look at the photos, I’m also proud of what I’ve accomplished in the time I’ve been here and how it’s coming together. Creating a home is a journey – and a long one at that. I’m trying to enjoy mine and not get too caught up in what I don’t have or haven’t accomplished yet. Thank you so much Jennifer, for sharing your beautiful home today! I’m looking forward to seeing more of it over the coming weeks and also to the next issue of the Celebrating Everday Life with Jennifer Carroll magazine. You and Rhoda have the same exact tour today. I do love Jennifer’s home and style. Jennifer’s home is gorgeous. There are quite a few ideas ii would like to steal. Love this home it is so beautiful and relaxing. Gorgeous home! !..I love the colors throughout Jennifer’s home…and Ralph Lauren is one of my favorite designers too…Jennifer, you have great style and would love to know more about your new publication!! Thanks Suzy for presenting Jennifer’s home today…. What a great tour, Suzy! Everything looks so soothing and inviting. Thanks so much for sharing! Lovely tour … everthing is so pretty! So beautiful, I especially love that silvered chest. Is there a tutorial on how you did it.